This property is directly associated with the initial period (1902-1920) of downtown commercial expansion that occurred due to local economic prosperity after the Klondike Gold Rush and in tandem with explosive population growth and suburban residential development. During this era, modern urban architectural scale began with the construction of the earliest steel-frame high-rise buildings and the establishment of a concentration of banking enterprises and department stores along Second Avenue from Cherry Street to Pike Street. The initial regrading of Denny Hill and the commercial redevelopment of the former University Grounds (University/Metropolitan Tract) were major factors that facilitated northward and eastward commercial expansion. In 1914, the owners of the Frederick and Nelson Department Store purchased property with the intention of building a large, five-story store at Fifth Avenue and Pine Street, thus solidifying the location of the future downtown retail core. A significant number of extant commercial properties dating from this era remain within the downtown commercial core, including: numerous hotels, banks, business blocks and early high-rise commercial buildings, as well as some specialty and department stores, clubhouses, apartment houses and theaters. Buildings that provided multiple-family housing in Seattle was not identified or described specifically as “apartment houses” prior to c.1903. During the late nineteenth and well into the twentieth centuries, numerous downtown hotel buildings functioned for long-term residential purposes. By 1905, several small apartment buildings had been constructed and were mingled primarily among the older single family residences located uphill and to the NE of the expanding commercial district. Most apartment construction during this era appears to have been concentrated further uphill along Yesler Way and on First Hill, as well as in burgeoning neighborhoods like Capitol Hill and Queen Anne Hill. As Denny Hill was removed and regraded in phases, small mixed use apartment buildings began to be constructed on the newly regraded lots. By the late 1910s, larger apartment houses had been constructed in the Denny Regrade area to the north of Stewart Street, including some extant examples: the Sheridan Apartments (1914); the Nesika Apartments (Stratford Apartments, 1915); and the Virginian Apartments (1917). During the 1920s, two large apartment hotels were constructed in the commercial core; however, major apartment house construction did not occur. Such development was heavily concentrated in residential neighborhoods, particularly First Hill and Capitol Hill where numerous noteworthy examples from this era remain. The construction of U.S. Interstate 5 severed the physical relationship between the subject building and other similar properties on First Hill. The Fischer Studio Building is a highly unique example of a residential real estate development; its construction was directly influenced by adjacent development within the downtown core during this era. Although the building eventually came to provide multi-family housing, it was originally planned and designed as a business block for George Fischer in 1912; thus, its initial design was influenced by typical business block development of the era. After the turn of the century, local economic prosperity generated the earliest construction of tall, steel-frame buildings at the northern edge of the existing commercial district. The structural design of these modern buildings allowed for both greater height and greater flexibility of layout and could accommodate a wider variety of tenants. This flexibility in design and use facilitated the subsequent changes in design of the building, which became known as the Fischer Studio Building. The expansion and northward shift of Seattle’s retail core attracted the San Francisco music and piano firm of Kohler and Chase to establish their Seattle headquarters in the initial business block, which included an elaborately designed retail shop with extensive window display space at the storefront level. Although the initial design plans were not fully realized, the newly emerging retail district near Pine Street influenced the location of a major music store within the building, which in turn appears to have also influenced the decision to later fit the upper stories for music studios. The Fischer Studio Building was largely designed and constructed in two separate design and construction phases. The first phase began in 1912 with a design for an office building created by local architects Bebb and Mendel. Charles Bebb (1856-1942) was educated in London and at a preparatory school in Switzerland before attending the University of Lausanne. He also studied engineering at the School of Mines in London and worked as a railroad engineer in South Africa before moving to the United States. By 1888, he had been hired by Adler and Sullivan in Chicago as the chief superintendent architect on the building of the Auditorium Building. In 1890, he was sent by Adler and Sullivan to superintend the building of the Seattle Opera House. The project was never built and late in 1890, Bebb, still in the employ of Adler and Sullivan, returned to Chicago. However, he returned to Seattle in September 1893 and became a designer for the local Denny Clay Company. His work there is credited with making the Denny Clay Company a leading producer of architectural terra cotta on the West Coast. By 1898, he had an independent architectural practice and by 1901, a partnership with Louis Leonard Mendel, who had also previously worked for Adler and Sullivan. The firm of Bebb and Mendel are particularly well known for the design of the Corona Building (1903) and the Hoge Building (1911). The firm was also responsible for the design of the Washington State Pavilion (destroyed) at the Seattle Alaska Yukon Exposition in 1909. After the Bebb and Mendel Partnership dissolved in 1914, Bebb formed a successful partnership with Carl F. Gould. According to an article from the Seattle Post Intelligencer dated June of 1912, plans were prepared for the construction of the first three stories and the basement to be completed first, in order for the tenant, Kohler and Chase, to occupy the new quarters as soon as possible. An additional five stories were to be added at a later date. At this time, the upper five floor levels were intended to be designed and fitted for offices, which would primarily serve as music-related studios, with a large recital hall on the top floor. Between the construction of the initial portion of the building and the design of the upper floor levels, the concept for the building appears to have changed from a business block to a specialized business and residential building. This programmatic change appears to have been related to desires expressed by the retail tenant, Kohler and Chase. A subsequent design and construction phase occurred in 1914-15. The plans architectural were prepared by Bebb and Gould and included a unique approach to housing performing artists (and teachers) in downtown Seattle, near complimentary retail outlets and performance facilities. The concept behind the design was to provide living, teaching, and performing space for dancers, musicians and vocalists within one building. In addition to residential and teaching space within individual units, the building provided a large performance space for recitals performed by the tenants/artists and their pupils. The modifications in the initial design were clearly influenced by the change in use, but were also due in part to the influence of Carl F. Gould, who had joined in partnership with Bebb in 1914. Upon establishing the new firm , Gould continued work on several large projects that Bebb or Mendel had already begun work on, including: buildings and sitework at the Chittenden Government Locks; the Fisher Studio Building; the Times Square Building; the Puget Sound News Company. Carl F. Gould (1873-1939) was born in New York, educated at Harvard and attended the Ecole de Beaux Arts in Paris (1898-1903). He interned with McKim, Mead and White (1903-05) and then assisted in the preparation of the Burnham Plan for San Francisco. He settled in Seattle in 1908 with significantly more impressive training than most local architects. He worked with Everett & Baker and then in 1909 he entered into partnership with Daniel Huntington, the skilled designer of numerous notable public and private projects. That partnership produced apartment and commercial buildings while Gould independently designed numerous residences and was an active promoter of the Bogue Plan. He also became the president of the Fine Arts Society, began lecturing at the University of Washington on domestic design and assumed leadership of the Architectural league of the Pacific Coast. In 1914, he founded the university of Washington Department of Architecture and headed the school until 1926. With Charles Bebb serving as principal engineer and construction manager, and Carl F Gould as the principal designer and planner, the two practiced in a flourishing partnership between 1914 until 1924. It became a leading local firm and flourished with over 200 local commissions, including schools, churches, hospitals, memorials, homes, clubhouses, and numerous commercial buildings executed in a wide range of historic revival and non-traditional modern architectural styles. Bebb and Gould produced several of Seattle’s most architecturally distinctive buildings, including: the Times Square Building; Suzzallo Library at the University of Washington; the U.S. Marine Hospital and the original Seattle Art Museum. However, after 1924 Bebb’s role in the firm was significantly reduced. The subject building had been constructed to the third floor level when Gould took charge, redrawing and designing the upper floor plans, street façade and the recital hall on the seventh and eighth floors. Among these changes were the inclusion of individual living quarters with kitchen and bath amenities (each unit also typically included a reception room and living/teaching space) on the fourth through eighth floors and an electrified “Fischer ‘Studios’ Building” sign to be located on the rooftop. Although the building was constructed in two phases and three different architects were involved in its design, the overall design was integrated into a continuous and cohesive whole. In 1918, a project involving fairly major interior alterations was undertaken. The plans, designed by Seattle architect George W. Lawton, called for the conversion of some units that only included reception and teaching rooms to living units with individual bathrooms. The plans also called for the conversion of some of the studio spaces into larger individual housing units complete with separate living and dining rooms, kitchens, and baths on the second, third, and fourth floors. These changes were possibly born out of the initial success of the project as a residential building. Other minor changes have occurred throughout the years to the storefront in order to accommodate a variety of tenants including a shoe store, an electronics store, and a health club. 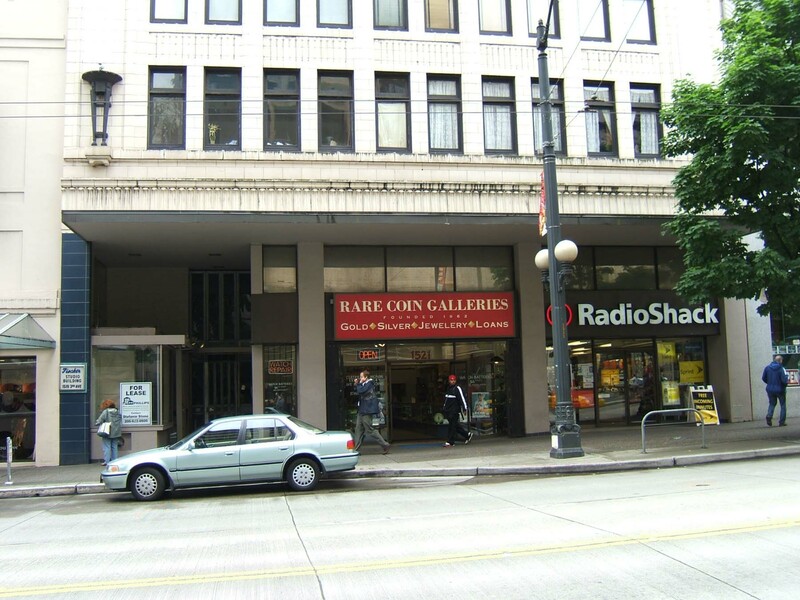 The historic preservation movement that took place in Seattle in the early 1970s led to upgrades and renovations of many older buildings in the downtown core, including the Fischer Studio Building. In 1974, noted local historic preservation architect Ralph D. Anderson purchased the building for $230,000 with plans to convert the existing studio spaces into apartment/condominium units for middle-income residents. Anderson was responsible for a several major early restoration projects in Pioneer Square, most notably the Pioneer Building and the Grand Central Building, and understood the unique opportunities presented by the Fischer Studio Building to not only provide housing at a lower cost, but at the same time, provide a new and valid use for a unique older building. Initial renovations brought the building up to the modern fire code and safety standards and included the installation of air conditioning. Additional renovations were undertaken in multiple and gradual stages. In most cases, several individual studio units were sold and then combined to create large, multi-bedroom condominium units. Other smaller units were also created by combining small studio units with adjacent studio spaces as new partitions were added to create separate living, dining, and bedrooms. The most notable interior alteration was the conversion of the former recital space (on the seventh and eighth floors) into a single condominium unit with a mezzanine for as Ralph Anderson’s own housing unit. Despite interior and storefront alterations, the exterior of the Studio Fisher Building is well-preserved and the building is an outstanding and rare example of a particularly unique apartment house property type from this era. It is a highly noteworthy example of the terra cotta design executed in an Italianate mode and is associated with a highly significant Seattle architecture firm Bebb and Gould and the career of an important local architect, Carl Gould. Located mid-block on the west side of Third Avenue between Pike and Pine Streets, this unique eight-story apartment building was constructed in two phases; the first three floors were built in 1912 and the remaining stories were added in 1915. As completed it provided two retail spaces at the storefront level, 64 small studio and one-bedroom apartments on five floor levels and the upper two floor levels were taken up by an auditorium performance space. It measures 60’ x 108’ with I-shaped plan at the upper floor levels that allows for north and south light wells for the residential spaces. In 1974 the building interior was remodeled and converted to create 40 condominium units. It exhibits a three-part vertical block façade composition and noteworthy Venetian-inspired architectural character. The reinforced concrete structure includes a foundation and basement and is entirely clad with ivory-color glazed terra cotta. The retail storefront level has been entirely remodeled although the bay spacing remains evident. The building shaft accentuates the five floor levels designed for residential uses. This portion of the façade is dominated by a wide enframed bay of tall, evenly-spaced rectangular window openings. Recessed spandrels are decorated with ribbed terra cotta panels that accentuate five bays of windows separated by enframed piers. Original ornate metal light fixtures/torches resting on projecting plinths flank the window bay at the wide second floor level sill line. Original casement sash with full transom windows appear to remain in place. The façade at the upper two floor levels (the auditorium level) is separated from the shaft by an intermediate cornice. It is richly embellished with terra cotta ornament, and given its historic use, it is not penetrated by window openings. Five large rectangular terra cotta panels are adorned with diamond-patterned blind tracery and separated by fluted pilasters. This element is surmounted by a highly decorated cornice and parapet feature adorned with a decorative frieze and corbel table at a moulded cornice and capped by an articulated parapet decorated with cresting and acroteria that incorporates eight grotesques. The fluted pilasters and grotesques at this level correspond with the enframed window bay and piers below. This building was remodeled and converted to create 25 condominium units in 1974, at which time some changes were made to window openings and walls at the side elevations and the original auditorium space was adapted for housing purposes. Reportedly some original classical details on the walls and ceilings of the space were retained. There do not appear to be any other intact or architecturally significant interior building features, finishes or public spaces. "To Spend $100,000 on Two Buildings - George W. Fischer to Improve His Property on Third and Fourth Avenues" Seattle P.I., April 4, 1912. "Fisher(sic) Building Conversion Set" Seattle Times, January 6, 1974.